When it comes to creating an immersive dining experience, few restaurant groups go to the extent that Tao has repeatedly proved. The supergroup’s latest endeavour is Vandal - a cavernous, multifaceted space in New York’s Lower East Side that distills the storied grittiness of its locale in up-market form. As its name might suggest, Vandal is a venue dedicated to the street. 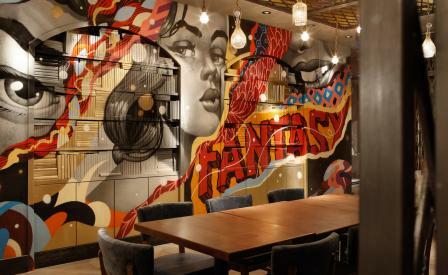 Art from seven recognised street artists serve as a backdrop for separate areas of the restaurant, while street fare from around the world graces each plate. Spread over two levels, Vandal’s interior has been cut into a maze-like configuration that adds to its allure. Rockwell Group created a series of catacombs, tunnels and lounges – even a flower shop and an indoor garden – where guests can experience a different vibe. In the secret garden, brick arched portal doors lead to a private courtyard bookended by two murals by Shephard Fairey. In the bar, a mural by Will Barras stands behind a sculptural counter topped with lapis blue granite. A series of dining rooms mix wall murals by Hush (also the curator of the project), bookcases that have been painted over by Tristan Eaton and plaster niches that have been chiseled out by the Portuguese artist Vhils. The adventure continues downstairs where a rich, playful cocktail lounge offers a change of pace. Cobalt blue walls and mismatched upholstered furniture are made all the more eclectic by a serpentine bar, traditional barstools and crystal pendant lights that will help to see the night away.